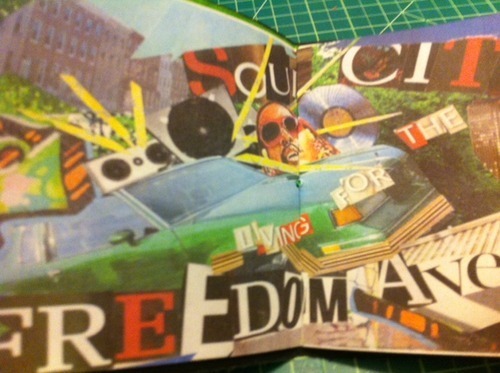 Here is a pic from my book arts mid-term, designed utilizing Toure’s short story “The Steviewondermobile” excerpted from his book The Portable Promised Land. Above is what the page looked like before I added the Turkish fold seen in the first pic. 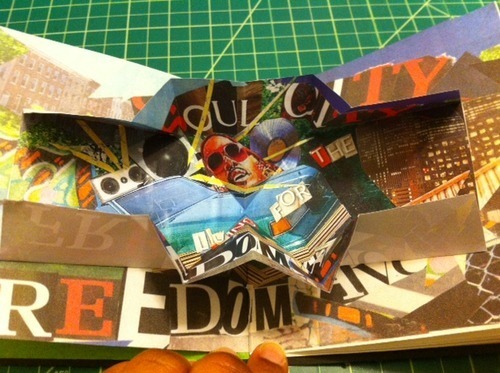 I absolutely adore collage and Turkish folds, both must be elements in my book final…if at all possible. Although I’m wondering about using ‘hair grease’ containers and having a pull accordion with text or adding a hot comb element like getting some towel-like textured cloth with striped burn marks from the comb or maybe that could be an image for the cover…hmmmm!!! HELP! If you have any ideas please share. Next PostNext TV ONE’s Unsung Taught Me I Love Disco!